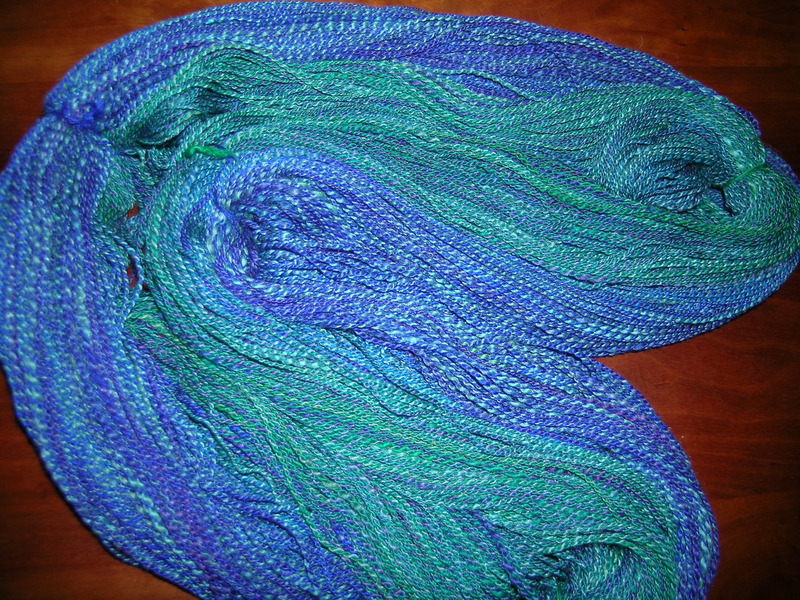 I finished plying my Fiber Optic gradient, Indigo to Emerald, with the Under the Sea dye break. The color changes are definitely subdued with this combination. I think that it will show through subtly when knit up. The yarn finished drying yesterday, and I took it to a knitting afternoon at a friend’s house. I couldn’t wait to start knitting these colors up. I am not super happy with my consistency on the spinning, but I think that it will look fine all knit up. 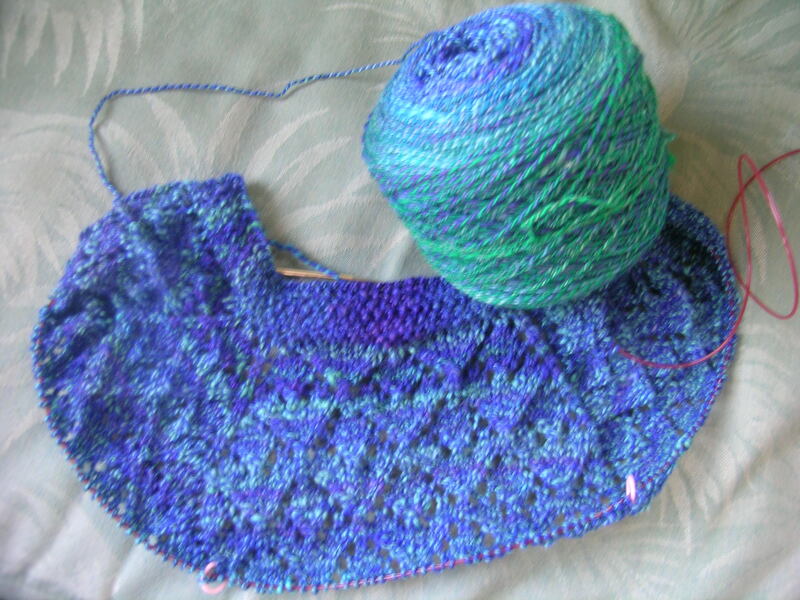 I am working on the Alka Faroese Shawl, by Myrna Stahman. I think that I have made this shawl 3 times, the pattern is fairly easy to memorize, and has enough visual interest, without over-powering the yarn. We are finishing Christmas decorations today. My poor husband, I made him re-do the garland outside 3 times, only to end up back with what we have every year. Lights are up and we bought our indoor tree (front porch tree went up a couple of weeks ago). I don’t know what I was thinking though, as it is a very skinny tall Frasier Fir. I love the smell, but should have gotten a wider tree. I am not sure though how many ornaments I have to put on the tree. Last year, over a week after Christmas I was sitting in the kitchen looking at how lovely the tree looked, and enjoying my morning coffee. I watched in slow motion as the entire tree toppled to the floor, crushing some of my favorite ornaments. I have not replaced many, as I usually like to get them after Christmas on sale. Decorations, music and some hot chocolate. Yesterday we saw the original Miracle on 34th Street at the local theater. Our Community Bank rents out the biggest theatre and shows an old Christmas classic every year, free to the community. Last year’s show was It’s a Wonderful Life. Getting in the spirit of the season. I really like the variety of colors in your yarn. I think the shawl is going to look beautiful once it is done. Oh, this is just gorgeous! I love it! Beautiful colors and a very lovely pattern. 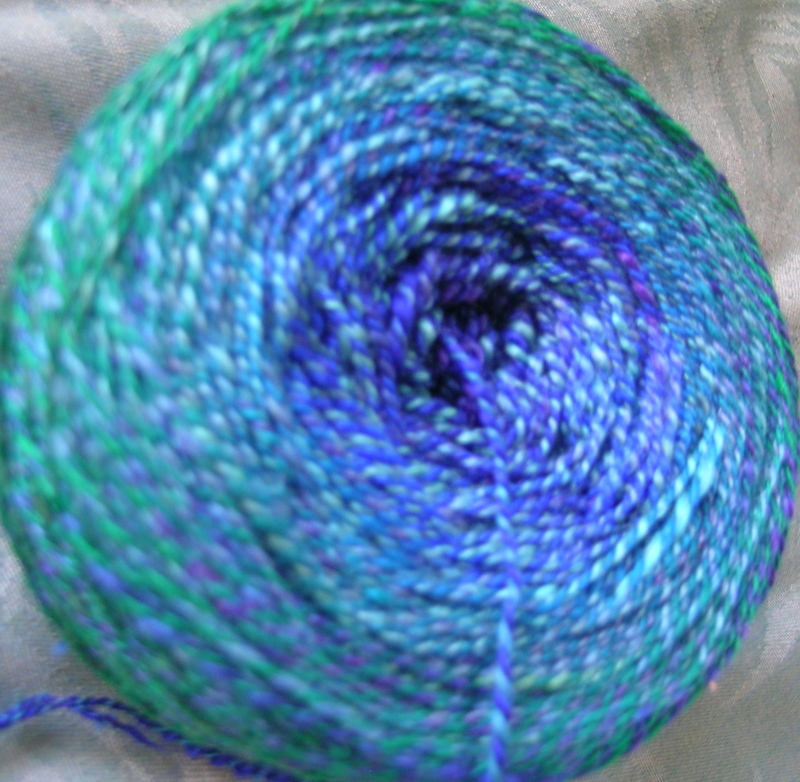 These colors are gorgeous–are you making a shawl?